Over the years, I’ve sat through various talks about what Key Performance Indicators (KPIs) “top executives” care about. Sometimes I’ve been impressed, other times shocked about the KPI examples that are thrown out there (trust me, CEOs do not care about click-though rate). At the same time, if you are working in a central role within an organization, you may find yourself pulled in all sorts of different directions when it comes to KPIs. Different groups often have different goals and measures in terms of what’s important to them. If you’re not careful, you could end up with a list of KPIs longer than the Royal Mile. So what do execs really care about? Ultimately, execs care about money – “How much money did you make the company this month?”. There may be softer, short-term initiatives that come down every once in a while that elevate other measures but long-term, execs need to show what is being returned to the company’s bottom line; they need to show value to the company. So the further removed your measures are to this, the less important they are to execs. At the same time, you need to track indicators that feed into this money measure. These indicators provide you with important insight as to why (or why not) you are delivering on the mullah, and if not which areas you need to be paying attention to. Top Level KPIs are leading measures that are most closely linked to company revenue goals (ie: what execs care about). They will show your execs what you are returning to the company’s bottom line. These KPIs should be money-related. Web Order Contribution – how much in offline orders did the web (as a whole) contribute towards sales? Search Marketing Contribution – how much of these web orders were contributed by search marketing? E-Commerce Sales – how much was sold online through e-commerce? In addition to hard currency, it’s also important to focus on additional KPIs that further show the value of your area – particularly measures that your group have more direct control over. Supporting measures often help ensure top-level KPI success, but rather than being money-related these KPIs tend to be count-related. Supporting KPIs are also important for companies who cannot attribute their web or search marketing activity directly to sales orders or revenue. Web Leads – how many leads were generated from the web? 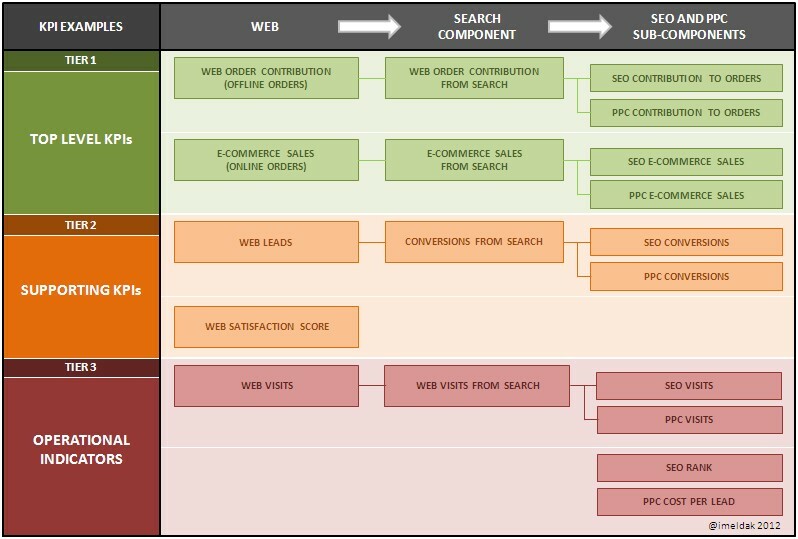 Key Conversions from Search –how many conversions were driven by search? Web Satisfaction Score – how did your web visitors rate their online experience? Operational indicators are tertiary measures that provide performance or efficiency indicators. These indicators tend to lean more on the tactical side and whilst they are often too much information for the likes of the higher-up execs, they do help to inform the day-to-day management of work. Web Visits from Search – how many visits to your website came from search? SEO Rank – how many of your SEO keywords are ranking above the fold? PPC Cost Per Lead – how much did it cost to get a conversion from PPC? Hopefully, this three-tier model will help you as you prioritize your KPIs and other supporting measures. Whilst the specifics of which KPIs you choose for each tier may vary (depending upon the measuring capabilities of your organization), it is important to start as close as possible with money-related measures, and have everything else flow down from there.